As organizer and nonplaying manager of the hapless 1890 Brooklyn Gladiators of the American Association, Jim Kennedy barely rates a footnote in the annals of major-league baseball. But during his turn-of-the-century heyday, Kennedy was a prominent actor in the sporting life of New York. As a young man he covered the National League New York Giants and AA New York Mets as a reporter for the New York Times. Later, he also became co-editor of a short-lived New York sports weekly. And in the fall of 1902, Kennedy was a leading but ultimately unsuccessful suitor for the American League franchise ticketed for Manhattan. All the while, Big Jim, a nickname founded on his size and ever-expanding waistline, was a local athletic club owner, a leading prizefight and bicycle-race promoter, and an American forerunner in the presentation of pedestrianism (professional race walking). Kennedy was in his entrepreneurial prime and in the midst of arranging a title defense for heavyweight boxing champion James J. Jeffries when a heart attack brought his life to a sudden close in April 1904. The surviving biographical evidence relating to our subject is sketchy. But US census data and contemporary newspaper reportage indicate that James C. Kennedy was born on the Lower East Side of Manhattan in April 1862. He was one of at least four children born to an Irish Catholic immigrant named Charles Kennedy about whom little has been discovered, and his wife Mary Ann (nee Shay), a seamstress and native New Yorker.1 As a boy, Jim attended the neighborhood’s St. Mary School, where his classmates included Timothy Daniel Sullivan, later New York State Senator Big Tim Sullivan, a Tammany Hall powerhouse and, on at least one occasion, a significant role player in Kennedy’s adult endeavors. In his youthful leisure time, Jim played sandlot and amateur baseball, developing a lifelong attachment to the game.2 He entered the work force as a teenage office boy for the New York Times. In 1883 cigar manufacturer/sportsman John B. Day placed teams in both the National League (Gothams, later Giants) and the American Association (Mets), and the Times soon assigned young Kennedy to cover them. While attending to his duties, Kennedy made the acquaintance of the already venerable Henry Chadwick and Frank Richter, soon-to-be editor of a new weekly newspaper titled Sporting Life. Jim also met Cincinnati sportswriter Ban Johnson. All three would play future parts in Kennedy’s life story. In short order Kennedy, together with fellow fledgling reporters P.J. Donahue, Will and June Rankin, George Stackhouse, and John Mandigo, formed “a new breed of New York City sportswriters.”3 During the Mets’ 1884 AA pennant-winning season, Kennedy doubled as official scorer for the club4 and came to be regarded as an expert on baseball rules and scoring decisions.5 Following club owner Day’s sale of the Mets and the team’s removal to Staten Island for the 1886 season, sportswriter Kennedy focused almost exclusively on National League affairs, and particularly those of the New York Giants. 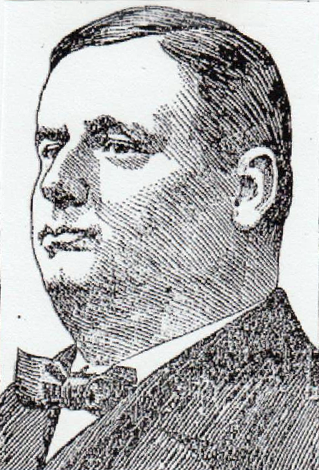 In March 1887 Kennedy and Donahue assumed the post of co-editors of The Sporting Times, a New York City-based imitator of Sporting Life underwritten by John B. Day.6 That winter Kennedy branched out further, accepting the post of secretary of the newly formed minor Central League,7 incidentally forming an association with Jersey City Skeeters club president/manager Patrick T. Powers that would last the rest of Kennedy’s life. In February 1888 Kennedy ventured into the realm of nonteam sports, joining with William O’Brien to stage a pedestrian race in Philadelphia.8 The following month, Kennedy and O’Brien put on a six-day walking contest at Madison Square Garden in Manhattan, with a handsome $2,000 purse going to the winner.9 But baseball was rarely far from Kennedy’s mind. That spring he and Pat Powers arranged the 1888 schedule for Central League umpires, and once the major-league season began, Kennedy was back in harness covering the Giants for the New York Times. By early 1889 Kennedy had severed his brief connection to The Sporting Times, thus permitting Henry Chadwick to discount reports that Kennedy had been dispatched to Europe as John B. Day’s private emissary to John Montgomery Ward, whose intention to form a new, player-controlled major league was an open secret.10 According to Chadwick, Kennedy and Day had fallen out, and “Jimmy’s visit to England was in the interest of his ‘pard’ in the pedestrian business,” Billy O’Brien.11 Still, it was Ward’s renegade Players League that precipitated the entry of sportswriter/race promoter Kennedy into the ranks of major-league club magnate and manager in early 1890. The arrival of the Players League unleashed a whirlwind of player and franchise relocations. With but few exceptions, the cream of National League playing talent jumped to the PL. The American Association endured fewer player defections, but suffered a stunning franchise loss. The 1889 AA pennant-winning Brooklyn Bridegrooms deserted the circuit to affiliate with the National League for the 1890 season. The Baltimore Orioles also quit the AA, expecting a similar invite to join the NL. But when that invitation was extended to the AA Cincinnati Reds instead, Baltimore began the new season as an unhappy member of the minor league Atlantic Association. The AA also lost its club in Kansas City, leaving four franchise vacancies needing to be filled before the new season commenced. In time, three of those slots were allocated to new clubs in Toledo, Syracuse, and Rochester. But to continue operation as an eight-team league, the AA still needed one more club. With the Players League Brooklyn Ward Wonders commanding newly built Eastern Park and the National League Brooklyn Bridegrooms occupying Washington Park II, there were no available playing grounds for the Kennedy club within Brooklyn territorial limits. The newly christened AA Brooklyn Gladiators would, therefore, be a Brooklyn team in name only. The Gladiators’ initial home field would be Ridgewood Park II in Queens, where Kennedy hoped Sunday home games would draw large working-class crowds. In the meantime, he needed to acquire playing talent. Unhappily for the new club boss, only over-the-hill vets (like pitcher Jack Lynch, shortstop Frank Fennelly, and second baseman Joe Gebhardt), untested youngsters, and the discards of other major-league teams were available. Still, “the rotund and blushing” Kennedy remained optimistic, informing Sporting Life correspondent J. F. Donnelly that he believed his Gladiators “as strong as any club in the Association.”16 Events on the field would soon disabuse him of that notion. With his ballclub hemorrhaging red ink, Kennedy solicited additional funds from unidentified franchise angels and informed the press that he was currently in negotiation for new ballpark grounds, “the very best in Brooklyn.”22 But the end was drawing near for Kennedy’s club, mired in last place and playing to empty grandstands. With the Gladiators teetering on the financial brink, Kennedy was persuaded, or so he later claimed, to take his club on a money-losing road trip to upstate New York, with player salaries and other club expenses to be underwritten by the AA league office. On August 25, 1890, the Brooklyn Gladiators ended their existence much as it had begun, dropping a 5-4 decision to the Syracuse Stars. Acting peremptorily, the American Association thereupon jettisoned the Brooklyn franchise, replacing it with the Baltimore Orioles, the erstwhile AA club that had thus far spent the season in the Atlantic Association. Jim Kennedy was now out of baseball, at least for the time being. By early winter, he was back staging race walking contests at Madison Square Garden, and scored a box-office hit with a match race between Englishmen George Littlewood and James Albert, “the greatest living pedestrians” in the world.27 He also returned to penning nonbylined baseball columns for the New York Times. But more and more Kennedy was gravitating toward the two sports that would now take precedence in his endeavors, boxing and bicycle racing. By 1894 he had acquired an interest in the Maryland Bicycle Club in Baltimore, and he was staging big-name fights at the Seaside Athletic Club on Coney Island.28 Two years later, Kennedy and Pat Powers (by now president of the minor Eastern League) became partners in bicycle-race promoting, reportedly netting a $10,000 profit from one six-day event conducted at the Garden in December 1896.29 As an added attraction, the two often employed prominent baseball figures like umpire Tim Hurst and player-manager Patsy Donovan as race starters or officials. Hurst and New York Giants stalwart Bill Joyce also refereed boxing matches for Kennedy. A serious crimp was placed in Kennedy’s business interests when the New York State Legislature passed a statute (the Lewis Law) that outlawed all forms of prizefighting in the Empire State, effective September 1, 1900. Fortunately for Big Jim, by then he had already become friends with James Wood Coffroth, a wealthy and well-connected young boxing enthusiast from San Francisco. Coffroth encouraged Kennedy to shift his boxing operations to California, where prizefighting had recently been legalized, and mentor him in boxing promotion.30 Using the Mechanics’ Pavilion in San Francisco as their base of operations, Kennedy and Coffroth were soon staging bouts featuring leading contenders. An early highlight of their collaboration occurred in November 1901 when reigning heavyweight champ Jim Jeffries successfully defended his crown with a six-round knockout of Gus Ruhlin, the bout being fought before the cameras of the Edison Manufacturing Company and becoming one of the earliest title fights ever captured on film. Later in 1903, Kennedy and Coffroth staged a memorable return bout between Jeffries and ex-champion James J. Corbett, with Jeffries retaining the title with a 10th-round knockout.31 Still, Kennedy was not neglecting his other interests. All the while, he remained engaged with Pat Powers in the staging of big-purse bicycle races on the East Coast. In early November Kennedy’s departure for an extended sojourn in Europe to sign cyclists for the winter bicycle race season34 cast doubt upon the likelihood of his being placed in charge of American League fortunes in New York. Then the Kennedy balloon was punctured by none other than Big Tim Sullivan himself. “Kennedy is a friend and I think well of him,” declared Sullivan, “but I do not know anything about his baseball plans. I am not a backer of a proposed American League club here, nor have I exerted my influence to have the New York baseball club turn over Manhattan Field35 to the new league. I have other matters to occupy my attention without getting into baseball.”36 With that, Kennedy was scratched off Ban Johnson’s list of club ownership prospects. Not long before the scheduled start of the 1903 season, Johnson’s hopes for an American League ballclub in New York were rescued by two creatures from the Manhattan netherworld: gambler/bookmaker/casino operator Frank Farrell and his Tammany Hall pal Bill Devery, the notoriously corrupt ex-chief of the New York City Police Department. Kennedy, meanwhile, continued his labors as a boxing and bicycle-race promoter. He also changed his domestic arrangements. Long a bachelor, Jim married an Irish immigrant named Kate Mulhearn, a fortyish widow with two adult children. The couple and Kate’s offspring promptly took up residence in the Sheepshead Bay section of Brooklyn, but their union would yield no additional children. By now Kennedy had grown to “massive” proportions,37 and was likely suffering from heart disease as well.38 Nevertheless, he kept up his peripatetic, bicoastal work schedule. Kennedy was appointed president of the American Athletic Promoters Protective Association, a newly formed organization designed to prevent abuse in bicycle racing,39 and soon extended his reach in the sport by leasing the track at Charles River Park in Boston and a racing oval in Philadelphia.40 He also traveled extensively arranging prizefights for the Yosemite Athletic Club in San Francisco. Negotiations for another West Coast title defense by Jim Jeffries, however, were complicated by difficulties with the heavyweight champ’s manager, William A. Brady. Brady, only recently a partner of Kennedy and Pat Powers in bicycle-race promotion, held an uncollected $20,000 breach-of-contract judgment against the two, and talks about another Jeffries title fight languished.41 Kennedy had smoother sailing with light heavyweight champion George Gardner, who agreed to a title defense against ex-heavyweight champion Bob Fitzsimmons in San Francisco.42 And as if he was not already busy enough, Kennedy also took on the management of former lightweight titleholder Frank Erne. On the evening of April 20, 1904, Kennedy left his home in Sheepshead Bay and boarded a train on the Brighton Beach line headed for Manhattan. He nodded to acquaintances as he took his seat, and then buried his face in a newspaper. Several stops later, Kennedy slumped forward, seemingly lifeless. He was removed from the train at a local station and transported to Cumberland Street Hospital in the Fort Greene section of Brooklyn. There he was officially pronounced dead, the victim of a heart attack.43 Jim Kennedy was only 42. After a funeral Mass at the Church of the Transfiguration in Williamsburg, Brooklyn, his remains were interred at Calvary Cemetery in Woodside, Queens. One of his obituaries maintained that Kennedy “was the Midas of boxing [and] of bicycling. He died a very rich man.”44 Yet when his widow petitioned for letters of administration, she averred the belief that Kennedy’s estate came to less than $500.45 Whatever the truth of the matter, this much is certain. A century after his death, James C. “Big Jim” Kennedy rests undisturbed among kindred souls: the legion of the once-prominent but now-forgotten figures who helped shape the rich and varied sporting history of New York. Sources for the biographical info recited herein include the Jim Kennedy file maintained at the Giamatti Research Center, National Baseball Hall of Fame and Museum, Cooperstown, New York; David Nemec, Major League Profiles: 1871-1900, Vol. II (Lincoln, Nebraska: University of Nebraska Press, 2011), 129-130; US Census data posted on Ancestry.com., and certain of the newspaper articles cited below. Unless otherwise noted, stats have been taken from Baseball-Reference and Retrosheet. 1 Jim’s known siblings were his sisters Maggie (born 1858), Nellie (1864), and Jennie Kennedy (1867). After the death of his father and his mother’s remarriage, Jim acquired half-siblings Sarah (1875) and Frank McGrath (1878). 2 Nineteenth century baseball scholar David Nemec described Kennedy as a “roly-poly former semi-pro infielder” in The Beer and Whisky League: The Illustrated History of the American Association, Baseball’s Renegade Major League (New York: Lyons & Burford, 1994), 188. 3 According to Sporting Life, March 10, 1886. 4 As subsequently noted in Sporting Life, September 15, 1885. June Rankin of the New York Herald did the official scoring for the Giants. 5 See Sporting Life, September 1, 1886: “It might be an act of kindness for our friend Kennedy, who is regarded by ballplayers as an expert scorer, to call at the Detroit Free Press office and deliver a short dissertation on base-hits and errors.” Later, Kennedy was among the cognoscenti recruited by the major leagues to assist in reformulation of the scoring rules. See Sporting Life, December 21, 1887. 6 As per Sporting Life, March 16, 1887. Kennedy (New York Times) and Donahue (New York Evening World), however, remained in the employ of their respective daily newspapers. 7 As per Sporting Life, December 7, 1887. Kennedy and Powers were appointed a committee of two to oversee certain administrative affairs of the new Central League. 8 As reported in Sporting Life, February 22, 1888. 9 Sporting Life, March 21, 1888. 10 Ward was then in England, finishing up his hitch on A.G. Spalding’s celebrated world baseball tour. 11 Chadwick’s Chat: Sporting Life, March 6, 1889. 12 Jim’s father died sometime after the birth of his sister Jennie in 1867, and by the early 1870s, Mary Kennedy had remarried, becoming the wife of an Irish immigrant engineer named Matthew McGrath. In the late 1880s, the family relocated to Brooklyn, and Jim Kennedy would remain a member of his stepfather’s household through the 1900 US Census. 13 At the time, Brooklyn was a municipality separate and distinct from New York City (then consisting of Manhattan and the West Bronx, only), and the third largest city in the country. Brooklyn and the other outer boroughs were not incorporated into the City of New York until January 1, 1898. 14 An attraction of the Ridgewood site was the mostly indifferent attitude about enforcement of Sunday blue laws in Queens. The grounds owned by Wallace (sometimes called Ridgewood Park II) were several blocks from another ballpark site owned by brewer George Grauer (Ridgewood Park I) that was occasionally used by Brooklyn during the 1886 season. 15 As reported in Sporting Life, February 15, 1890. 16 See Sporting Life, April 5 and 12, 1890. 17 As reported in Sporting Life, May 24, 1890. 18 Sporting Life, May 31, 1890. 19 As reported in Sporting Life, June 14, 1890. The games of John B. Day’s National League New York Giants at the New Polo Grounds were being outdrawn by those of the Players League Giants, played a 10-foot-wide alley away in Brotherhood Park, and Day, whatever his previous differences with Jim Kennedy, was desperate for additional revenue to keep his imperiled club from falling into bankruptcy. 21 The Brooklyn Gladiators would post a 0-2 record in their Sunday appearances at the Long Island Grounds. 22 As per Sporting Life, July 11, 1890. 23 As per Robert L. Tiemann, “Major League Attendance” in Total Baseball, 7th ed., John Thorn, Pete Palmer, and Michael Gershman, eds. (Kingston, New York: Total Sports Publishing, 2001), 74. Baseball-Reference and Retrosheet provide no attendance figures for the 1890 Brooklyn Gladiators. 24 See the Chadwick and Richter columns in Sporting Life, August 30 and September 6, 1890. 25 See, e.g., Sporting Life, September 13 and October 4, 1890. 26 The major-league American Association ceased operation after the 1891 season. 27 See Sporting Life, June 21 and November 22, 1890. 28 Among the past and future boxing champions fighting at the Kennedy-owned Seaside Athletic Club were heavyweights Jake Kilrain, James J. Corbett, and Bob Fitzsimmons, lightweight George “Kid” Lavigne, and featherweights Young Griffo and George Dixon, all future members of the International Boxing Hall of Fame. 29 According to Sporting Life, December 19, 1896. 30 “Sunny Jim” Coffroth (1872-1943) would go on to become the dean of West Coast boxing promoters. For more on his early partnership with Big Jim Kennedy, see Paul J. Vanderwood, Satan’s Playground: Mobsters and Movie Stars at America’s Greatest Gaming Resort (Durham, North Carolina: Duke University Press, 2009), 30-31. 31 The first title bout between reigning titleholder Jeffries and former champ Corbett had been staged at Kennedy’s Seaside Athletic Club on Coney Island on May 11, 1900. Jeffries stopped Corbett in the 23rd round. 32 As quoted in the Trenton Evening Times, September 27, 1902. 33 See the Ann Arbor (Michigan) Argus, October 24, 1902. The players later named as being under contract to the nascent AL New York club included such notables as Willie Keeler, Jack Chesbro, and Jesse Tannehill, as well as some lesser lights. See the Baltimore Sun, January 8, 1903. 34 As reported in the Pawtucket (Rhode Island) Times, November 11, 1902, Kansas City Star, November 15, 1902, and (Jersey City) Jersey Journal, November 24, 1902. 35 Aside from the current Polo Grounds (née Brotherhood Park), the only already existing ballpark in Manhattan was Manhattan Field (originally the New Polo Grounds), the former home field of the New York Giants and situated next door to the Polo Grounds. But the long-term lease to Manhattan Field was held by hostile Giants owner Brush, and thus the site was unavailable to the American League. 36 As per the Cleveland Leader, November 11, 1902. 38 As per the Kennedy obituary in the (Brooklyn) Standard Union, April 21, 1904. 39 As reported in the New Orleans Item, January 8, 1902, Seattle Times, January 18, 1902, and elsewhere. 40 As reported in the Bay City (Michigan) Times, January 3, 1903, and Worcester Daily Spy, April 20, 1903. 41 As reported in the Denver Post, April 25, 1903, and Sporting Life, May 2, 1903. 42 As reported in the Los Angeles Times and San Diego Union, September 28, 1903. Fitzsimmons took a 20-round decision and the light-heavyweight crown from Gardner at the Yosemite Athletic Club in early November 1903. 43 As per the Brooklyn Eagle and Brooklyn Citizen, April 21, 1904. See also, the New York Times, San Francisco Chronicle and Omaha World-Herald, April 21, 1904, and Sporting Life, April 30, 1904. 44 Per David Nemec, Major League Profiles: 1871-1900, Vol. II (Lincoln, Nebraska: University of Nebraska Press, 2011), 130, quoting the Los Angeles Times. 45 See In the Matter of James C. Kennedy, Deceased, petition of Kate Kennedy, filed May 10, 1904, Kings County Probate Court, accessible online via Ancestry.com.